Accounts receivable funding provides financing alternatives for businesses. Learn invoice factoring to expand or start a company with helpful articles and how-to ebooks. We have assembled our hottest selling informational resources all in money-saving bundles. You can also find these items available individually with detailed descriptions in the Bookstore. 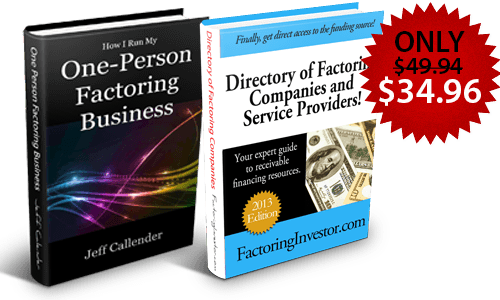 The Introduction to Factoring Bundle includes two of our best sellers, the 2017 Directory of Factoring Companies and How I Run My One Person Business. You get both for the special discounted price of $34.96. The Factoring Essentials Bundle is where most people start. You get an amazing overview of the factoring industry with real world content you can use today! Receive the entire set of nine best-selling factoring books (including the 2017 Directory of Factoring Companies) for the low price of $97.00. 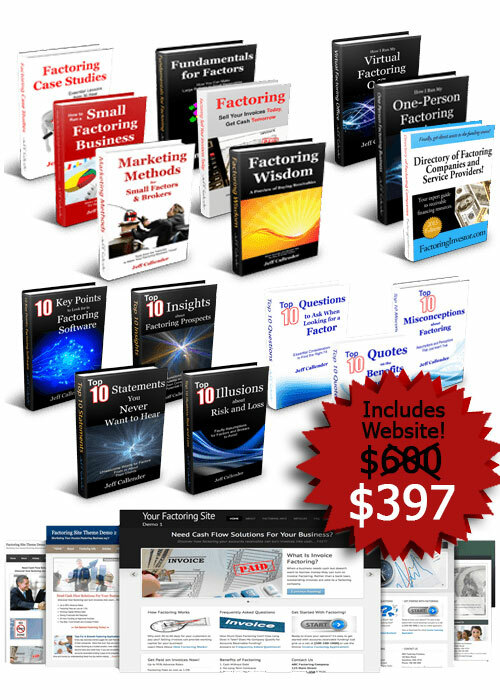 The Factoring Essentials Bundle includes: 2017 Directory of Factoring Companies, How I Run My One Person Business, Factoring Case Studies, Factoring: Sell Your Invoices Today Get Cash Tomorrow, Factoring Wisdom, Fundamentals for Factors, How I Run My Virtual Office, How To Run a Small Factoring Business, and Marketing Methods For Small Factors & Brokers – You get the entire package of ebooks in a PDF Download for only $97.00. The Complete Factoring Toolkit is where the rubber meets the road. It is designed for those individuals looking to start a factoring business, gain insider knowledge, and have a strong marketing presence – fast. Not only do you receive the entire Factoring Essentials Bundle, you also get the Factoring Top 10 series AND your very own turn-key Factoring Website – complete with the content and online forms to get your factoring business started! 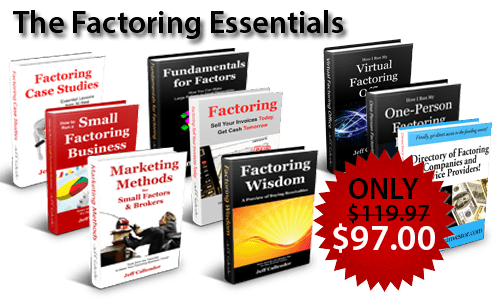 The Complete Factoring Toolkit includes: The Factoring Essentials Bundle, Directory of Factoring Companies, and the Factoring Top 10 Series for a total of 16 ebooks PLUS your very own Factoring Website for only $397.00. You can find more information on the websites at FactoringWebsites.com – including your theme choices and live demos. This turn-key website alone sells for $347 and is included with one year of free hosting in this incredible package. This package is a MUST for anyone serious about presenting a professional image (and wanting to save some $$$ in the process)! …you need quality information from someone that knows the industry inside and out. We believe we have put together one of the easiest ways for you to get up to speed on the factoring industry. Use the information to stat a new factoring business, sell your own invoices, or even bring your current business to the next level! Just how confident are we? All of our products have a 30-day, full money-back guarantee. No BS. You don’t even owe us an explanation. If for some reason you don’t feel the product lives up to the reviews, simply email us and let us know – we will make it right! We can offer that because we know the product is that good! We look forward to working with you and thanks for stopping by!